This is a simple Bayesian network, which consists of only two nodes and one link. It represents the JPD of the variables Eye Color and Hair Colorin a population of students (Snee, 1974). 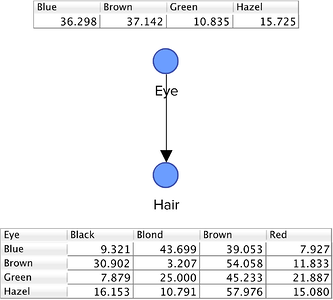 In this case, the conditional probabilities of Hair Color given the values of its parent node, Eye Color, are provided in a CPT. It is important to point out that this Bayesian network does not contain any causal assumptions, i.e. we have no knowledge of the causal order between the variables. Thus, the interpretation of this network should be merely statistical (informational). This is another simple yet typical Bayesian network. 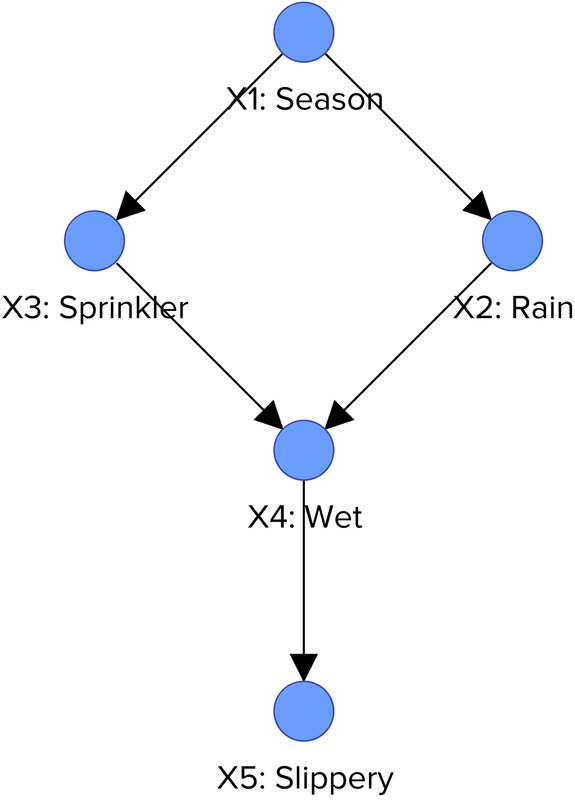 In contrast to the statistical relationships in the previous example, this network describes the causal relationships among the seasons of the year (X1), whether it is raining (X2), whether the sprinkler is on (X3), whether the pavement is wet (X4), and whether the pavement is slippery (X5). Here, the absence of a direct link between X1 and X5, for example, captures our understanding that there is no direct influence of season on slipperiness. The influence is mediated by the wetness of the pavement (if freezing were a possibility, a direct link could be added). Entities that live in a changing environment must keep track of variables whose values change over time. Dynamic Bayesian networks capture this process by representing multiple copies of the state variables, one for each time step. A set of variables Xt-1 and Xt denotes the world state at times t-1 and t respectively. A set of evidence variables Et denotes the observations available at time t. The sensor model P(Et|Xt) is encoded in the conditional probability distributions for the observable variables, given the state variables. The transition model P(Xt|Xt-1) relates the state at time t-1 to the state at time t. Keeping track of the world means computing the current probability distribution over world states given all past observations, i.e. P(Xt|E1,…,Et). Dynamic Bayesian networks (DBN) are a generalization of Hidden Markov Models (HMM) and Kalman Filters (KF). Every HMM and KF can be represented with a DBN. Furthermore, the DBN representation of an HMM is much more compact and, thus, much better understandable. The nodes in the HMM represent the states of the system, whereas the nodes in the DBN represent the dimensions of the system. For example, the HMM representation of the valve system is made of 26 nodes and 36 arcs, versus 9 nodes and 11 arcs in the DBN (Weber and Jouffe, 2003). Of course, practical applications of Bayesian networks go far beyond these "toy examples." Here is a selection of tutorials, webinars, and seminars, which show the broad spectrum of real-world applications of Bayesian networks.